In sixth grade, frustrated that there were no girls' soccer teams, Shue tried out and won a spot on the boys' team, and played against boys for three years. When her high school wouldn't add a girls' soccer team, she took up gymnastics, and became captain of the team. Shue started acting professionally when she was a student at Wellesley College, with commercials for Hellmann's Mayonnaise and Burger King. With a baby-face that allowed her to play girls much younger than her age, she was perfect for teen roles without needing any of the oversight required for child actors. At 21 playing 16, she played Ralph Macchio's romantic interest in the original Karate Kid movie. The next year she co-starred in Call to Glory, a TV series about a military family in the early 1960s, with Craig T. Nelson as her dad. At 25, she was still believable as a harried high school girl in Chris Columbus's farce Adventures in Babysitting. She finally grew up in Cocktail, but went back to high school as Michael J. Fox's girlfriend in two sequels to Back to the Future (a different actress had played the part in the original). Since then her better films have included the soap opera comedy Soapdish, the guardian angel sing-a-long Heart and Souls, and Hide and Seek. She was Oscar-nominated in 1995, for Leaving Las Vegas. Her worst performance is probably Molly, as an institutionalized autistic who undergoes brain surgery. She has politely but emphatically complained that most Hollywood movies give actresses nothing to do beyond gazing into the leading actor's eyes and playing "his girlfriend", "his wife", "his mother", etc. 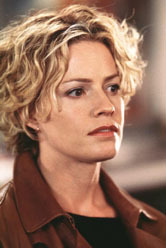 Between movies, Shue earned her BA in Political Science from Harvard in 2000. Shue comes from a blue-blood Ivy League family that traces its genealogy back to the Mayflower. Her brother Andrew achieved some fame as an actor on Melrose Place and played professional soccer. Another brother, John, was captain of the Harvard soccer team, and produced Gracie, a film loosely based on 15-year-old Elisabeth's soccercentric response to the sudden death of her oldest brother, William. The film was directed by her husband, Oscar-winning director Davis Guggenheim. Her father-in-law, Charles Guggenheim, was a documentary filmmaker who was Oscar-nominated 11 times, and won four.